Listen Up: Star Wars Marvel Comics… Plif! In this SPECIAL, EXCLUSIVE 3 HOUR EPISODE, the Freaks turn their focus on one of their favorite Marvel Star Wars comics, “Plif”! Issue #55 introduces us to the Hoojibs and the awesome creative direction that the comics took. 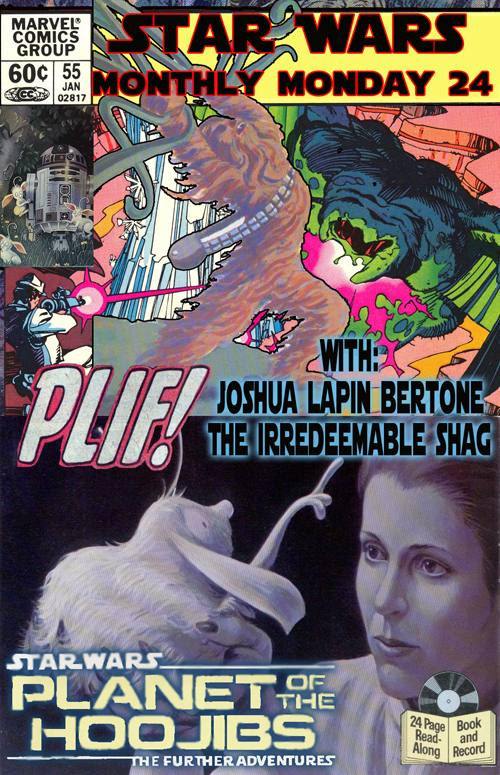 Joining the Freaks are Joshua Lapin-Bertone, who has been known to sling a mean Marvel Star Wars podcast himself and The Irredeemable Shag, a man who loves Hoojibs so much that it is probably illegal. Basically, we are pushing the envelope of geekdom here. We’re talking Super-Nerds, Star Wars, comic books, tangents and the epic kiddie record adaptation of the comic – “Planet Of The Hoojibs”! What? You want more?! Well, wait until the end when you get to find out which guest’s HOUSE CATCHES ON FIRE! Seriously, you can hear the smoke alarm…. THAT’S HOW “HOT” THIS SHOW IS! I had an absolute blast recording! These guys are hilarious and really know their Star Wars. Click here to check out their awesome podcast. Somewhat related and just for fun… I made a Plif reference on the Dark Horse Comics message board back in 2006 and Star Wars Legacy writer John Ostrander commented! How cool is that! Click here for that forum thread. Just found the book recently and downloaded the mp3 for my son. I still have that read-along-cassette!! lol talk about a blast from the past.